At the heart of McCOR Management’s approach to building value into every office or industrial building project is the understanding that all developments come with their own set of unique strengths and characteristics. Off-the-shelf solutions simply don’t apply and we work hard to create bespoke outcomes for each client based on an in-depth understanding of all facets of a building and its surroundings. We do our homework – local market conditions, current industry trends, demographic data or environmental legislation – to ensure that the recommendations and strategies we implement are decisive and informed. With a clear focus on the client’s financial objectives, we identify unique selling characteristics and then map out the right tenant fit to ensure we adopt the correct techniques to attract, secure and retain them. We believe that long-term, mutually beneficial relationships are built on service excellence. A collaborative, integrated service that ensures consistency and efficiency from the ground up. We adopt a proactive approach to property maintenance that garners a high level of tenant satisfaction, ensuring our clients’ operations run smoothly and efficiently allowing for optimal profits and increased value. Drawing on our vast experience accumulated across an array of commercial projects of various sizes and complexity, we adapt to and understand the intricacies involved in all types of projects from office towers to mixed-use developments. 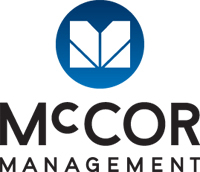 Whether we are advising on land acquisition and site planning or delivering facility management and ongoing maintenance, McCOR Management’s integrated approach helps you to maximize your revenue while managing your expenses.